Last winter while Mr. Barrette Plett, our school counsellor, was visiting Mrs. Lindsay Smith’s grade 1 & 2 classroom they were imagining with the students what they might see on a walk in the winter. This comical conversation sparked the idea for a story which Mr. Plett wrote and Mrs. Smith illustrated. 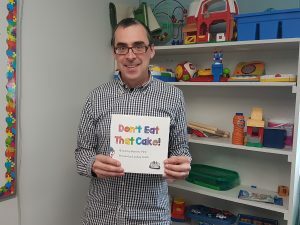 The result was a self published book called Don’t Eat That Cake which is now available on Amazon. Mr. Plett will be sharing the book with students at our school during the month of October.